On July 4th, 1976, my parents hosted a Fourth of July breakfast for a few of their neighbors to celebrate the bicentennial of our country. It was a small group; my mom made pancakes for everyone on her patio with her electric griddle. For twenty more years they hosted the breakfast. Every year it grew larger, every year it became more festive. When my parents grew tired of hosting it, another neighbor took over hosting the event because it had become such a cherished part of the neighborhood. Several years ago, my brother began hosting a breakfast in his neighborhood. This year, I decided it was time for my family to begin the tradition. We had a mix of family, neighbors, and friends. We had all the necessary brunch food, festive decor, and shooting off of fireworks after breakfast. But for my children, no Fourth of July breakfast would be complete without the talk my father, the former American History teacher, gives every year. This year he reminded us that the founding fathers, determined to break away from England, chose to do it in a way that laid out for the rest of the world the reasons for their decision in Thomas Jefferson's Declaration of Independence. 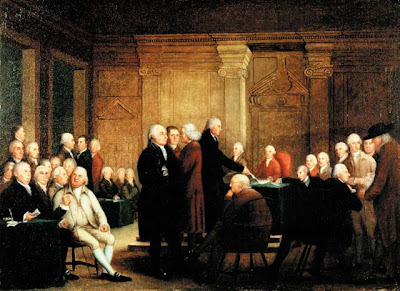 On July 2, the brave men of the Second Continental Congress voted in favor of independence. Despite the great risk, these men put their names to a document that ended this way: "...we mutually pledge to each other our Lives, our Fortunes, and our sacred Honor." My father ended his talk by asking us if the people of this country were still willing to make this pledge, hoping that we all were. I hope you all had a wonderful Fourth of July but made sure to take some time to remember the reason for the celebration. This sounds like a fantastic way to spend Independence Day! I love traditions like that! I wish my family had some. Looks like I'll have to be the tradition maker. Since your father is a former history professor, could you, would you ask him for some titles that give a good general history of the Revolutionary War, Civil War, World War I, and World War II? I've heard that 1776 is good for the Revolutionary, but I don't know any other books. I'd appreciate it! I'll talk to him but I'm warning you, you may get a list of five or six for each war!